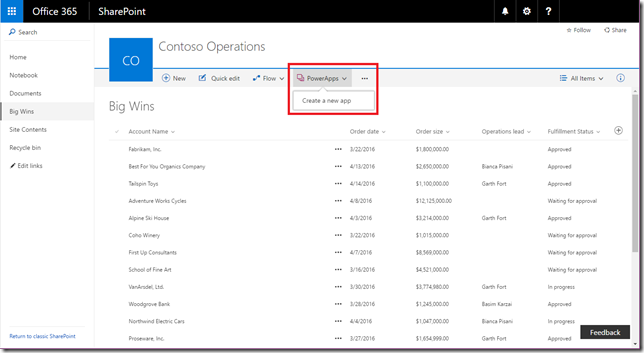 SharePoint: Make Your Data More Accessible Than Ever With PowerApps | Learn iT! Technology as a means of collaboration is indisputably here to stay, but the means in which it is implemented can often create more problems than it solves. With more and more processes and tools being digitized, how sure are you that your team is using SharePoint to it’s greatest potential?The information stored in SharePoint is only as good as it is accessible. If no one can find the information they need when they need it, what good is it? PowerApps are simplified, easy-to-make mobile apps designed to tap into new modern SharePoint lists and present the data contained within them in a mobile friendly way. ●Give your new app a name and you’re off! To access created apps, download the PowerApps app from the iOS App Store or Google Play Store. Once you open the app you’ will see all your created PowerApps!